When I was a kid, my dad would sometimes take me to the Carvel store near our house for an ice cream cone. I didn't even like ice cream all that much - I remember I would eat a little bit of the cone and then wonder what the heck I was supposed to do with the rest of it before it melted down my arm - but I certainly recognized the appeal of going out for ice cream. And that, I think, is what my dad was going for: that summery, skip work for an hour, sit on a bench and eat a melty, chocolatey, childhood treat feeling. In retrospect, I wish that he, a transplanted New Yorker, had known about the plethora of ice cream outing opportunities that existed just beyond our little corner of the state. They started making ice cream in 1988, but something about a trip to Salem Valley Farms takes me back to the 1950s...when I wasn't even close to being alive yet. Still, the simplicity of this little red stand with its unpaved parking lot and picnic tables gathered on a patch of grass is old-fashioned in the best way. And though I can't prove it, I think they use the most, and the biggest, chocolate chips. 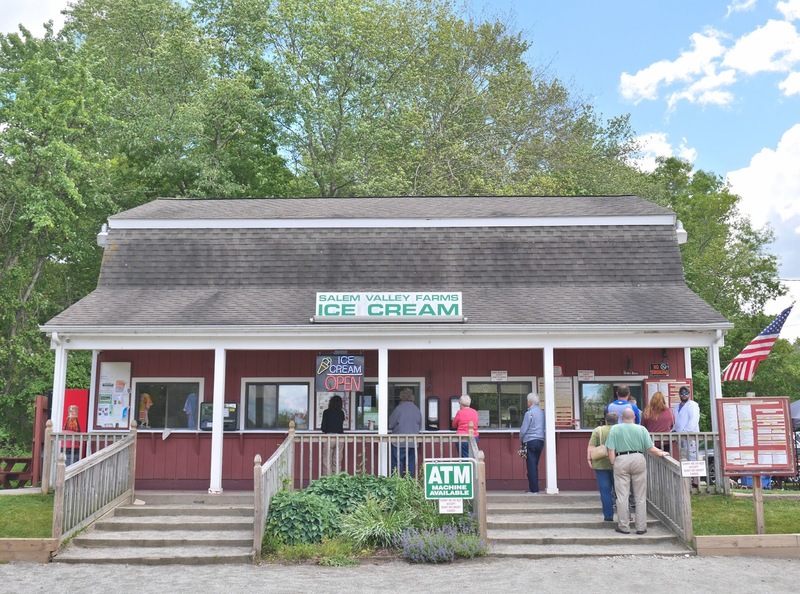 The first time I turned up the driveway to Rich Farm Ice Cream, slightly hidden away in the New Haven County countryside, I could tell this place was a local (and beyond local) favorite. It's named for the family who run it, not the richness of the ice cream, but that interpretation works too. There are picnic tables. There are silos. There are cows. There will probably be a line. Get on it. You probably wouldn't guess on first sight that there's ice cream for sale at the unassuming Tulmeadow Farm in West Simsbury. Driving past, you'd notice the displays of flowers and the cluster of old red buildings set among rolling hills. But stop and follow the excited children lining up in front of the little farm store, and you'll find a creamery with the best tasting cones ever. Yes, the cones themselves. Does anyone ever just eat cones without ice cream, straight from the package of cones? If so, these would be those cones. If you've driven past Buttonwood Farms in mid-summer, you've probably noticed the cars stopped along the side of the road and the acres of sunflowers in the fields. But past the sunflowers (sales of which go to Make-A-Wish Connecticut), and the corn maze, and the other fun attractions, there is yummy ice cream that's worth standing on a (sometimes very long) line for. And even if you miss the sunflowers, the eastern Connecticut setting is idyllic. If this post inspires you to you go off in search of the best ice cream ever, keep in mind that ice cream stands like these are not the cheapest places to grab a frozen dessert, and many only take cash. Also, they will probably smell like cow and there may be bees, flies, and so on. It's all worth it. I have not tried any of these and I've been in this state my entire life. And I love ice cream! What's wrong with me? I'll start to mend my ways right away. If you find yourself back in Fairfield County, try Ferris Farms in Newtown. They are similar to Rich Farms, with benches and cows... on Route 302, not far from the Flag pole.